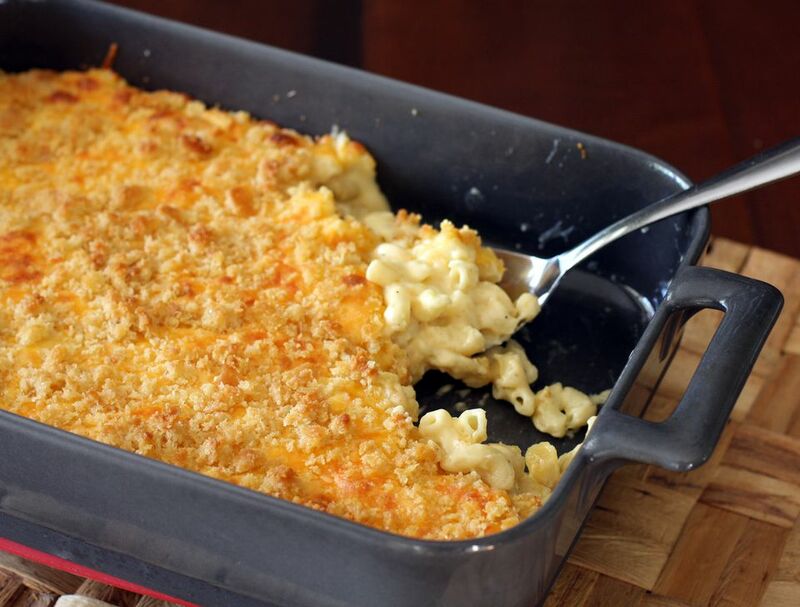 This extra creamy macaroni and cheese casserole is made rich and flavorful with a combination of shredded cheddar and American cheeses, along with light cream and seasonings. The buttery croissant crumbs top this casserole off in a great way but feel free to use soft fresh bread crumbs in the recipe instead. Cook the macaroni in boiling salted water following package directions; drain in a colander and rinse with hot water. In a medium saucepan or saucier, melt the 4 tablespoons of butter over medium heat until foamy; stir in the flour until bubbly. Add the milk and cream, along with the salt, pepper, and mustard. Cook, stirring constantly until thickened. Stir in 2 cups of the cheese until melted. Add the drained macaroni and blend well. Melt the remaining 2 tablespoons of butter and toss with the croissant crumbs. Sprinkle over the casserole. Bake for 25 to 35 minutes, until bubbly and nicely browned.